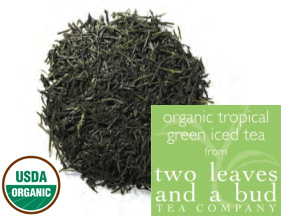 Two Leaves Organic Tropical Green Iced Tea coats the lips with its delicious flavor. Comes as a case with twenty four 1oz filter bags. Pour � gallon of boiling water over the filter bag, steep until desired color/flavor is reached, remove the filter bag, add ice & water. Simple! Each filter bag makes 1 gallon of tea.